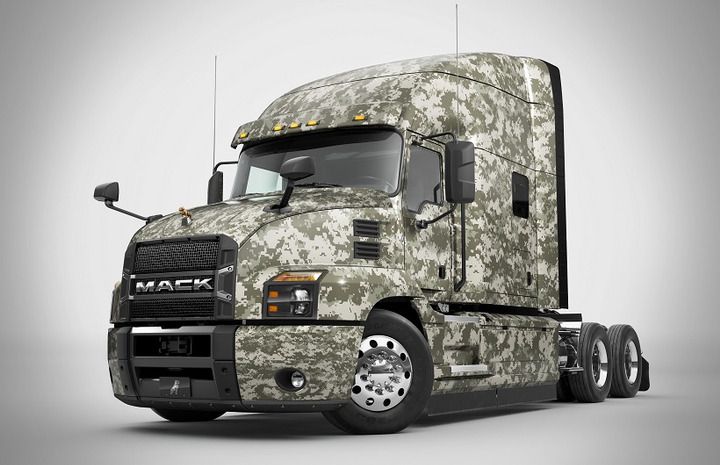 Mack Trucks donated a custom Mack Anthem truck to American Trucking Associations in an effort to bring in military veterans to the trucking industry. Mack Trucks has donated a Mack Anthem 70-inch Stand Up Sleeper model to American Trucking Associations to assist in the group’s efforts to bring in military veterans to the trucking industry. The Mack Anthem 70-inch Stand Up Sleeper model sports a unique camouflage-styled wrap to help attract attention to the ATA’s message while participating in hiring events for veterans at schools, career fairs, and military bases. The truck will also make a visit to the Marine Corp. Museum in Quantico, Va., and the new U.S. Army Museum in Ft. Belvoir, Va.
ATA’s Anthem model is equipped with a Mack MP8HE-415SE engine with 415 horsepower and 1,660 lb.-ft. of torque and Mack mDrive automated manual transmission. The custom Anthem will be driven by truck drivers from ATA’s Share the Road program, who give live safety exhibitions demonstrating how to drive safely alongside heavy duty trucks for students, media, and policy makers.